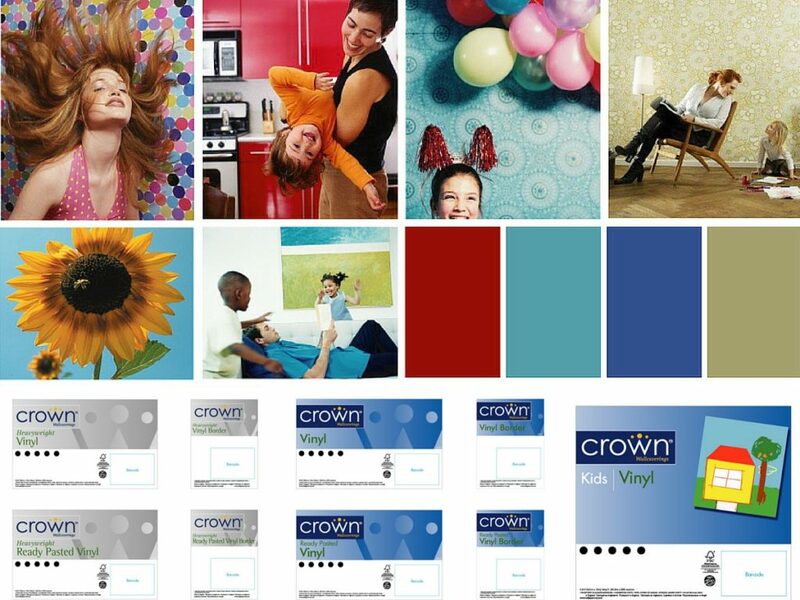 Crown is one of the great heritage brands of British wallpaper, founded in the 19th Century. It is owned by CWV and has always been a popular brand with practical appeal for families. Crown wallpaper is a hard-wearing range of vinyl wallpaper products with a range of specialist wallpapers for bathrooms and kitchens. The challenge for mass market wallpaper brands has been to compete successfully against paint for share of wall space. Manufacturers have invested in improving the ease of application and in improving the design appeal. They have also been careful to stay in tune with paint colour palettes because of the trend to co-ordinate a feature wall of wallpaper with three painted walls. Explore how to ‘bring back the crown’ because the logo had lost the visual link to the ‘crown’ and its association with top class performance. Retain the core brand colours based on yellow, the colour of royalty, sunshine and creativity, together with a clean bright blue reminiscent of summer skies. Remove the references to Home Furnishings. Updated the colour palette with a modern yellow, blue and silver combination. Simplified the logo and Crown icon for greater visual impact.